Russian National Guard troops will purchase 1,800 air-to-ground S-8KOM missiles for their combat aircraft. The total value of the contract in the framework of the state defense order will be approximately 100 million rubles. Missiles will be received by the agency in the coming months. Information about the order is available on the website of public procurement. Cumulative fragmentation unguided S-8 / KOM aircraft have been used by Soviet / Russian security forces since the 1970s. These missiles are designed to destroy enemy personnel from the air. According to experts, the purchased missiles will be used by the Rosguard helicopter pilots in combat training, including during firing and drills. According to the open press, about 60 multipurpose Mi-8 helicopters and about 10 Mi-24 assault helicopters are in service with the Rosguard aviation, which was created on the basis of the Interior Ministry troops. Rosgvardiya carries out a large-scale re-equipment of its aviation, as part of which it is carried out a major overhaul of the machinery at its disposal and the purchase of new ones. According to official information, the ministry is planning to purchase a new Mi-8AMT, Mi-8AMTSH and heavy Mi-35M. In January 2019, two new Mi-8MTV helicopters received parts of the Rosguards based in the Crimea. Earlier it was reported that the troops of the Russian Guard were entrusted with the protection of the Kerch bridge. This task is of particular relevance in the light of the recent provocations of the Ukrainian side in the region of the Kerch Strait. 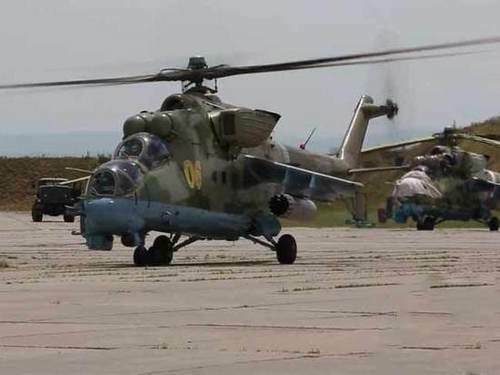 In addition, in the second half of 2018, the Rosguard troops repaired a large batch of combat helicopters, including the Mi-24 / Mi-24P, Mi-8 (14 pieces) and Mi-8MTV-2 (8). Rotary-wing cars have been overhauled and upgraded. Rosgvardiya Aviation performs combat missions in the North Caucasus, where an operational team of the Federal Service of the National Guard is also operating.